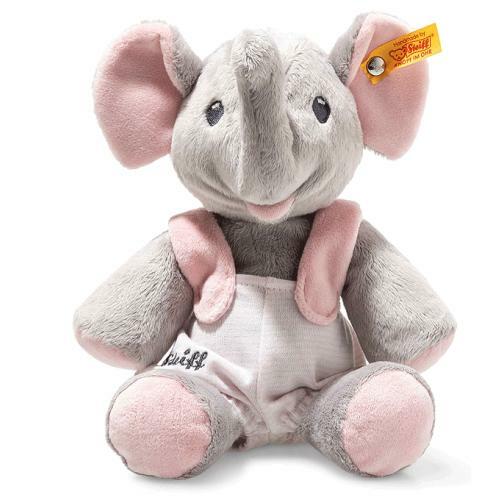 Steiff Trampili Elephant is hand made in the finest grey and pink cuddly soft plush. 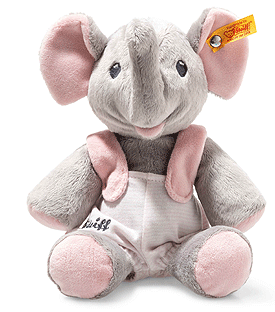 At 24 cm tall, Trampili elephant is one special plush toy. He is made of cuddly grey and pink plush material for your baby's soft skin. This sweet little guy features stitched-on eyes and is dressed in pants with white and pink stripes. The braces are pink on the outer surface and have pink dots on the inner surface. The inner ears, soles and feet have been designed in pink. The pants feature an integrated elastic band and can be removed. On his right pant leg, the "Steiff" logotype has been embroidered in dark grey.